Tuesday, February 24, 2015, Chairwoman Janet Yellen gave her semiannual monetary policy report to the U.S. Congress. It was much anticipated as the market had awaiting for some time to get clues for Fed’s plans for rate-hike and/or any changes to monetary policy. Here is the prepared speech in its entirety with my comments and observations. You can also read the speech here. Chairman Shelby, Ranking Member Brown, and members of the Committee, I am pleased to present the Federal Reserve’s semiannual Monetary Policy Report to the Congress. In my remarks today, I will discuss the current economic situation and outlook before turning to monetary policy. The S&P 500 closed a 1973.28, which was -0.2% below previous day, and the Dow Jones Industrial Averages closed almost unchanged at 17060.68. The 10-year Treasury Yields were at 2.55% and 30-year yields at 3.37%. TLT, the iShares 20+ Year Treasury Bond ETF closed at 112.86, -0.2% below previous day. Since my appearance before this Committee last July, the employment situation in the United States has been improving along many dimensions. The unemployment rate now stands at 5.7 percent, down from just over 6 percent last summer and from 10 percent at its peak in late 2009. The average pace of monthly job gains picked up from about 240,000 per month during the first half of last year to 280,000 per month during the second half, and employment rose 260,000 in January. In addition, long-term unemployment has declined substantially, fewer workers are reporting that they can find only part-time work when they would prefer full-time employment, and the pace of quits–often regarded as a barometer of worker confidence in labor market opportunities–has recovered nearly to its pre-recession level. However, the labor force participation rate is lower than most estimates of its trend, and wage growth remains sluggish, suggesting that some cyclical weakness persists. In short, considerable progress has been achieved in the recovery of the labor market, though room for further improvement remains. 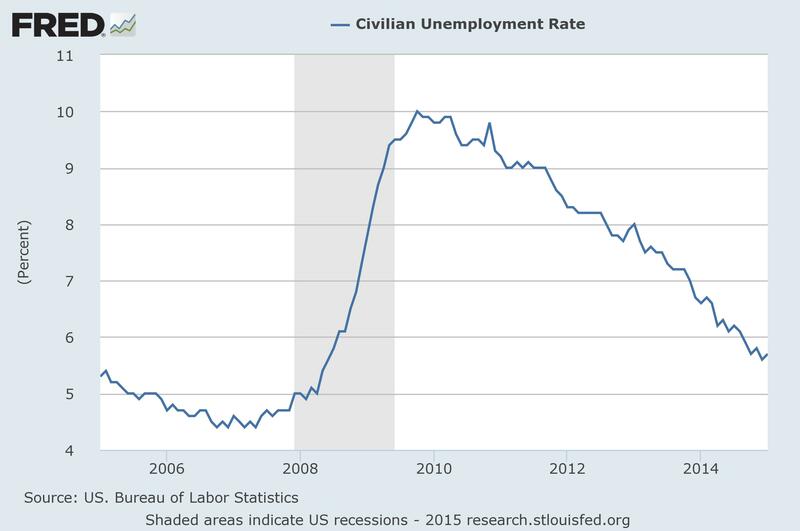 Here is the 10-year chart of the unemployment rate. The current rate of 5.7% is the lowest since July 2008, when it stood at 5.8%. As of February’s Non-Farm Payroll report, the nation added 3.3 million jobs in the past 12-month period. Out of this, 60% or 1.83 million jobs were added since her last testimony in July, 2014. 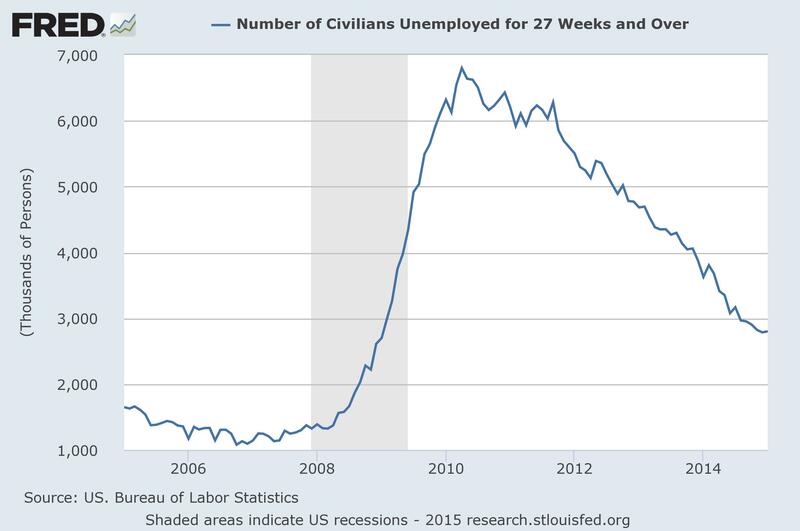 The trend for long-term unemployed, those who are unemployed for more than 27-weeks, is also similar to that of the unemployment rate. The decline has maintained the trend since Chairwoman’s last testimony. After peaking in 2010 at 6.8 million, it has been on a steady decline. In January 2015, this number was at 2.8 million. It was below this number in January 2009. The civilian labor participation was highest in 2000, when it stood at 67.3%. 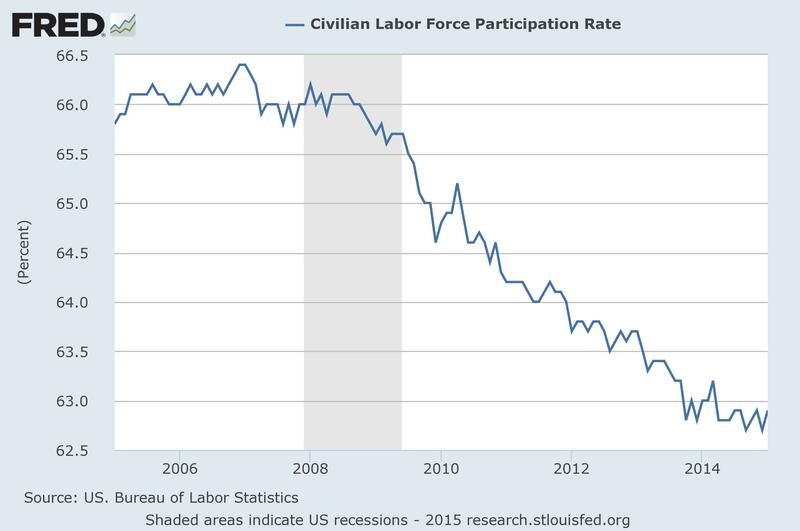 The participation rate has been steadily declining since January 2007 high of 66.4%. Since July 2014, it has not moved much. It was 62.9% in July and now it is again back at that level. 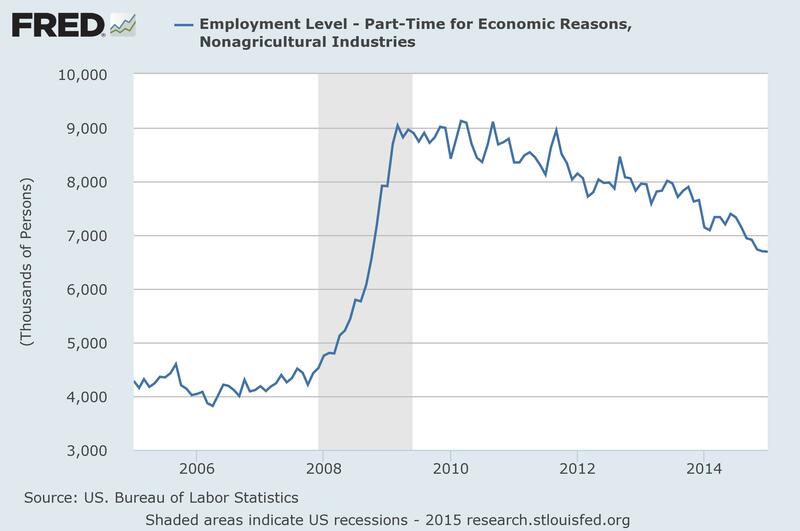 The part-time employment has generally been declining since 2010, which with lower unemployment rate means that more people are getting full-time employment. At the same time that the labor market situation has improved, domestic spending and production have been increasing at a solid rate. 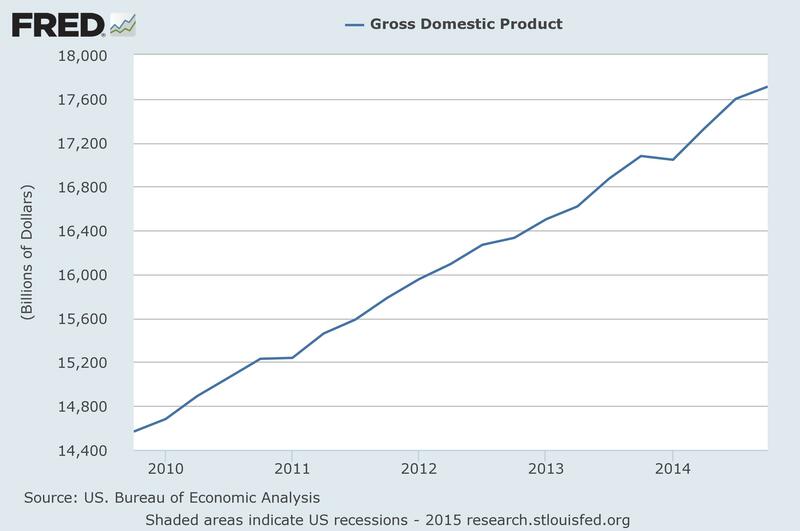 Real gross domestic product (GDP) is now estimated to have increased at a 3-3/4 percent annual rate during the second half of last year. While GDP growth is not anticipated to be sustained at that pace, it is expected to be strong enough to result in a further gradual decline in the unemployment rate. Consumer spending has been lifted by the improvement in the labor market as well as by the increase in household purchasing power resulting from the sharp drop in oil prices. However, housing construction continues to lag; activity remains well below levels we judge could be supported in the longer run by population growth and the likely rate of household formation. 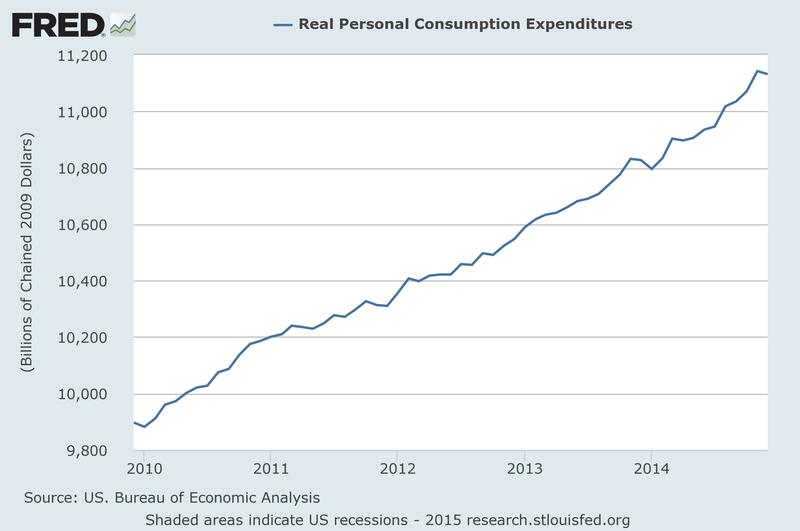 Here is how the U.S. GDP and the Real Personal Consumption Expenditure have fared since 2010. The trend is up, which is good. 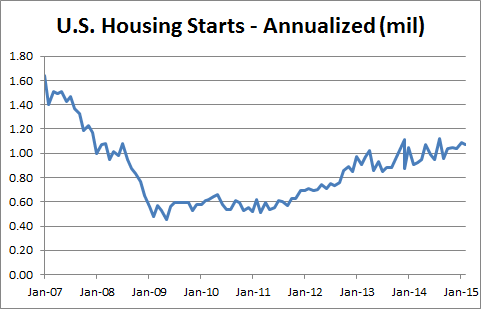 The housing start is also trending up but it is not near the pre-crisis levels. Despite the overall improvement in the U.S. economy and the U.S. economic outlook, longer-term interest rates in the United States and other advanced economies have moved down significantly since the middle of last year; the declines have reflected, at least in part, disappointing foreign growth and changes in monetary policy abroad. Another notable development has been the plunge in oil prices. The bulk of this decline appears to reflect increased global supply rather than weaker global demand. While the drop in oil prices will have negative effects on energy producers and will probably result in job losses in this sector, causing hardship for affected workers and their families, it will likely be a significant overall plus, on net, for our economy. Primarily, that boost will arise from U.S. households having the wherewithal to increase their spending on other goods and services as they spend less on gasoline. The crude oil prices have declined a lot since her testimony. The West Texas Light Crude Oil was 99.96 on the day of her July 2014 report. Yesterday, it closed 50% below at 49.95. The same thing happened with the Goldman Sachs Commodity Index. On July 15th 2014, it closed at 627.84. Yesterday, it closed at 410.59 – a 35% decline. 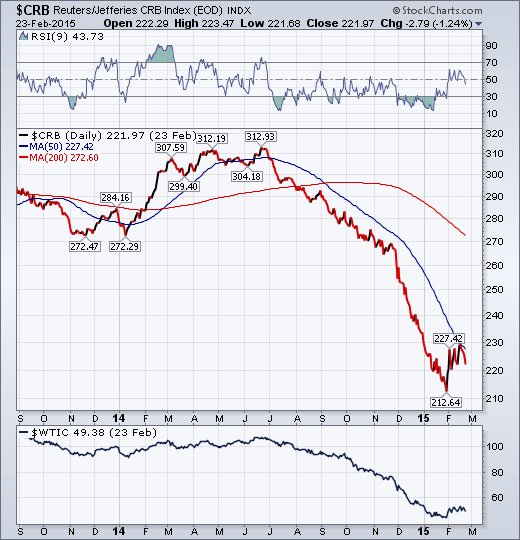 Here is the chart of another commodity index, Reuters/Jefferies CRB Index with the West Texas Crude oil. 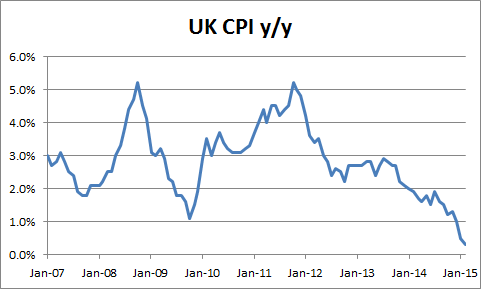 The downward trend is steep and is not over yet and the deflationary pressures are real. Foreign economic developments, however, could pose risks to the outlook for U.S. economic growth. Although the pace of growth abroad appears to have stepped up slightly in the second half of last year, foreign economies are confronting a number of challenges that could restrain economic activity. In China, economic growth could slow more than anticipated as policymakers address financial vulnerabilities and manage the desired transition to less reliance on exports and investment as sources of growth. In the euro area, recovery remains slow, and inflation has fallen to very low levels; although highly accommodative monetary policy should help boost economic growth and inflation there, downside risks to economic activity in the region remain. The uncertainty surrounding the foreign outlook, however, does not exclusively reflect downside risks. We could see economic activity respond to the policy stimulus now being provided by foreign central banks more strongly than we currently anticipate, and the recent decline in world oil prices could boost overall global economic growth more than we expect. Yesterday, February 23, 2015, the Bank of Israel became the latest central bank to cut interest rates. The central banks of other major countries who have cut rates recently include Canada, the European Zone, Switzerland, Sweden, Denmark, China, Australia, India, Turkey, Indonesia, Chile, South Korea. So clearly, the rest of the world is concerned with growth prospects. Here is how the inflation levels are in four major economies. 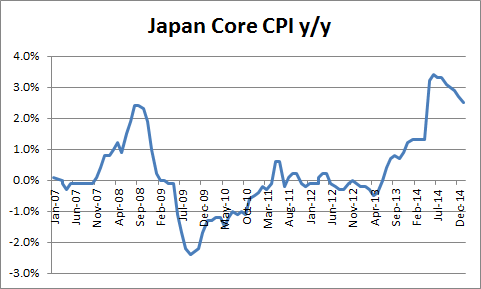 Japan is the only one which is seeing healthy inflation, due to Abenomics. 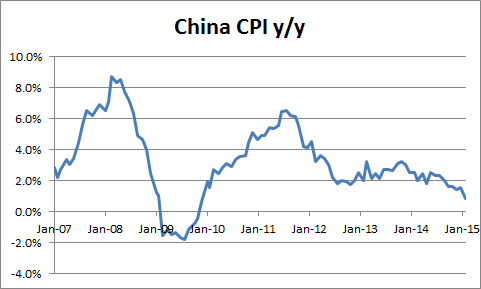 Others are seeing disinflation or deflation. 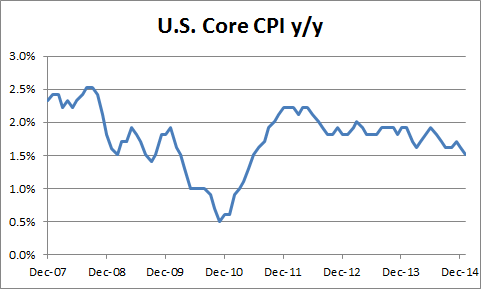 U.S. inflation continues to run below the Committee’s 2 percent objective. 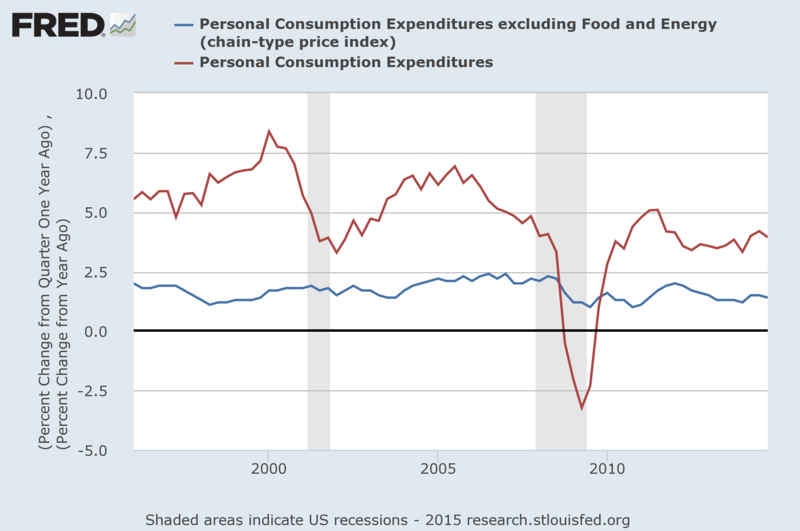 In large part, the recent softness in the all-items measure of inflation for personal consumption expenditures (PCE) reflects the drop in oil prices. Indeed, the PCE price index edged down during the fourth quarter of last year and looks to be on track to register a more significant decline this quarter because of falling consumer energy prices. But core PCE inflation has also slowed since last summer, in part reflecting declines in the prices of many imported items and perhaps also some pass-through of lower energy costs into core consumer prices. Despite the very low recent readings on actual inflation, inflation expectations as measured in a range of surveys of households and professional forecasters have thus far remained stable. However, inflation compensation, as calculated from the yields of real and nominal Treasury securities, has declined. As best we can tell, the fall in inflation compensation mainly reflects factors other than a reduction in longer-term inflation expectations. The Committee expects inflation to decline further in the near term before rising gradually toward 2 percent over the medium term as the labor market improves further and the transitory effects of lower energy prices and other factors dissipate, but we will continue to monitor inflation developments closely. 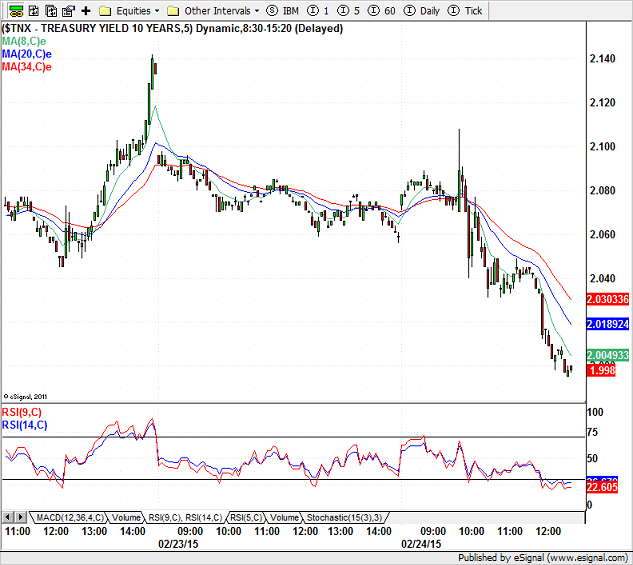 The bond market clearly took Chairwoman Janet Yellen’s testimony to be dovish as demonstrated by the 5-minute chart of the 10-year US Treasury Yields. It has a decidedly downward trend. The 30-Year US Treasury Yields chart since late June, before her last testimony, is also trending down. 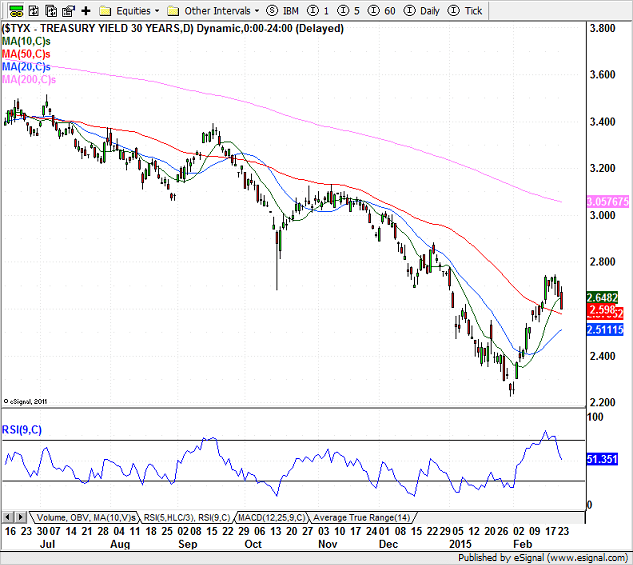 Even though the yields have risen this month, the trend does not look to be over. I will now turn to monetary policy. The Federal Open Market Committee (FOMC) is committed to policies that promote maximum employment and price stability, consistent with our mandate from the Congress. As my description of economic developments indicated, our economy has made important progress toward the objective of maximum employment, reflecting in part support from the highly accommodative stance of monetary policy in recent years. In light of the cumulative progress toward maximum employment and the substantial improvement in the outlook for labor market conditions–the stated objective of the Committee’s recent asset purchase program–the FOMC concluded that program at the end of October. Clearly the FOMC thinks that its actions have born fruits and the economy is improving because of them. It also does not think that its conclusion of QE3 has not in any way hampered the economy. 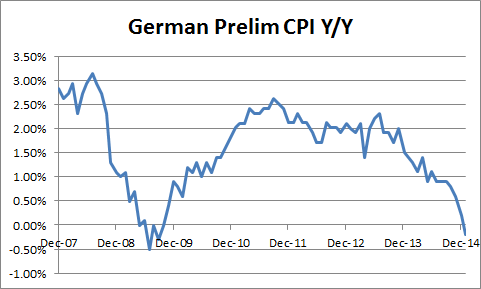 So the current monetary posture will continue. Even so, the Committee judges that a high degree of policy accommodation remains appropriate to foster further improvement in labor market conditions and to promote a return of inflation toward 2 percent over the medium term. Accordingly, the FOMC has continued to maintain the target range for the federal funds rate at 0 to 1/4 percent and to keep the Federal Reserve’s holdings of longer-term securities at their current elevated level to help maintain accommodative financial conditions. The FOMC is also providing forward guidance that offers information about our policy outlook and expectations for the future path of the federal funds rate. In that regard, the Committee judged, in December and January, that it can be patient in beginning to raise the federal funds rate. This judgment reflects the fact that inflation continues to run well below the Committee’s 2 percent objective, and that room for sustainable improvements in labor market conditions still remains. Even though, FOMC thinks that the economy has improved and it is comfortable with the unemployment rate, it is not comfortable with the current level of inflation. In her Q&A session, in an answer to a question by Senator Schumer, Chairwoman said that she is seeing no signs of inflation ticking up to 2% soon. Seems like the rates will stay put at the current levels. The FOMC’s assessment that it can be patient in beginning to normalize policy means that the Committee considers it unlikely that economic conditions will warrant an increase in the target range for the federal funds rate for at least the next couple of FOMC meetings. If economic conditions continue to improve, as the Committee anticipates, the Committee will at some point begin considering an increase in the target range for the federal funds rate on a meeting-by-meeting basis. Before then, the Committee will change its forward guidance. However, it is important to emphasize that a modification of the forward guidance should not be read as indicating that the Committee will necessarily increase the target range in a couple of meetings. Instead the modification should be understood as reflecting the Committee’s judgment that conditions have improved to the point where it will soon be the case that a change in the target range could be warranted at any meeting. Provided that labor market conditions continue to improve and further improvement is expected, the Committee anticipates that it will be appropriate to raise the target range for the federal funds rate when, on the basis of incoming data, the Committee is reasonably confident that inflation will move back over the medium term toward our 2 percent objective. Seems like that the word ‘patient’ will be there for at least couple of more meetings. After that it will depend upon the data. It is possible that some members of FOMC want to increase rates but they also think that the data is not favoring that. It continues to be the FOMC’s assessment that even after employment and inflation are near levels consistent with our dual mandate, economic conditions may, for some time, warrant keeping the federal funds rate below levels the Committee views as normal in the longer run. It is possible, for example, that it may be necessary for the federal funds rate to run temporarily below its normal longer-run level because the residual effects of the financial crisis may continue to weigh on economic activity. As such factors continue to dissipate, we would expect the federal funds rate to move toward its longer-run normal level. In response to unforeseen developments, the Committee will adjust the target range for the federal funds rate to best promote the achievement of maximum employment and 2 percent inflation. In her Q&A, Chairwoman Yellen said that increasing rates prematurely will have the risks of recovery faltering. So she is listening toe economist like Larry Summers, who are asking her not raise rates. She also said that, “We do not want to overshoot inflation target of 2% and do not want to chronically undershoot it.”, which means she is hedging her options and will be data dependent. Let me now turn to the mechanics of how we intend to normalize the stance and conduct of monetary policy when a decision is eventually made to raise the target range for the federal funds rate. Last September, the FOMC issued its statement on Policy Normalization Principles and Plans. This statement provides information about the Committee’s likely approach to raising short-term interest rates and reducing the Federal Reserve’s securities holdings. As is always the case in setting policy, the Committee will determine the timing and pace of policy normalization so as to promote its statutory mandate to foster maximum employment and price stability. She and the FOMC are not too concerned of ways to get back to normal monetary policy environment. The FOMC intends to adjust the stance of monetary policy during normalization primarily by changing its target range for the federal funds rate and not by actively managing the Federal Reserve’s balance sheet. The Committee is confident that it has the tools it needs to raise short-term interest rates when it becomes appropriate to do so and to maintain reasonable control of the level of short-term interest rates as policy continues to firm thereafter, even though the level of reserves held by depository institutions is likely to diminish only gradually. The primary means of raising the federal funds rate will be to increase the rate of interest paid on excess reserves. The Committee also will use an overnight reverse repurchase agreement facility and other supplementary tools as needed to help control the federal funds rate. As economic and financial conditions evolve, the Committee will phase out these supplementary tools when they are no longer needed. Some details and more light to the thinking behind the normalization mechanism that would be deployed. The Committee intends to reduce its securities holdings in a gradual and predictable manner primarily by ceasing to reinvest repayments of principal from securities held by the Federal Reserve. It is the Committee’s intention to hold, in the longer run, no more securities than necessary for the efficient and effective implementation of monetary policy, and that these securities be primarily Treasury securities. She feels that Fed will have enough time and tools to act in a timely and orderly manner and that it will not create any panic. In sum, since the July 2014 Monetary Policy Report, there has been important progress toward the FOMC’s objective of maximum employment. However, despite this improvement, too many Americans remain unemployed or underemployed, wage growth is still sluggish, and inflation remains well below our longer-run objective. As always, the Federal Reserve remains committed to employing its tools to best promote the attainment of its objectives of maximum employment and price stability. Overall, this was more of a dovish testimony. It shows that Fed is cautious about its monetary policy approach but is also confident that the economic conditions are improving and the monetary environment is moving in the direction that it wants. February 24, 2015 in Market Commentary.